The best hearing aids can’t be the same for everyone. The hearing aid that is right for you will depend on a lot of factors, one of the main ones being the severity of your hearing loss. The best hearing aid for a severe hearing loss will be very different from the best hearing aid for someone with a mild hearing loss, or even someone with a moderate hearing loss. We are going to break down which hearing aids are the best for severe hearing loss for adults, why we believe they are the best, and some other things you should take into consideration if you have a severe hearing loss. If there is a specific topic you’d like to read more about, use the Table of Contents below to skip to that section. When considering a new hearing aid, you should always speak to a hearing specialist before you make your decision. Our free tool can match you with trusted hearing centres offering the latest hearing aids. Our top pick for the best hearing aid for severe hearing loss is the Phonak Naida B. There are three style options to choose from; a RIC, BTE SP (Superpower), and BTE UP (Ultrapower) so the fitting range will be sure to provide an adequate amount of gain for a severe hearing loss. It includes several automatic and manual programs to accommodate changing environments, with a focus on improving speech intelligibility in noise. There is a DuoPhone feature for landline phone use which allows the wearer to hear the phone conversation in both ears simultaneously. 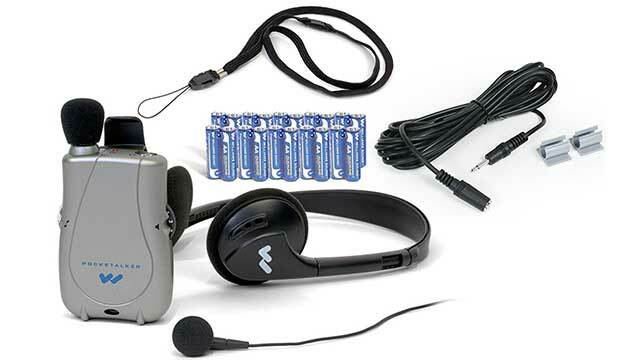 It has a telecoil and an FM System (Roger) can be easily integrated with the hearing aid for more support in background noise or classroom/lecture situations, church etc. It is also compatible with Phonak’s bluetooth accessories for smartphone streaming. It has an IP68 rating which means it is water and dust resistant for good reliability/durability. 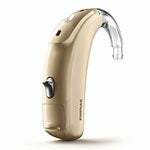 The Phonak Naida B device is made specifically for a severe or profound hearing loss. 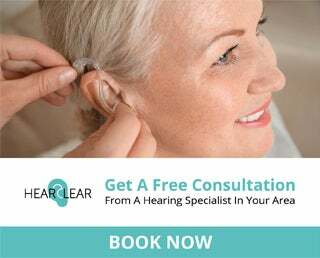 It takes into account all the hearing needs that a person with severe hearing loss would have, including adequate amplification, clear sound quality, reliability and compatibility, and does an excellent job. Our runner-up for the best hearing aid for severe hearing loss is the Oticon Opn. It is also a Made for iPhone hearing aid for streaming audio directly from iPhone, iPad, etc. It should be noted that the Opn in the Plus Power BTE and miniRITE-T models are brand new products as of June 2017. Based on the Opn product, which launched in May 2016, we anticipate the addition of these new styles to be a great solution for people with severe hearing loss, but will continue to monitor this product for updates. What is a severe hearing loss? What makes a good hearing aid for severe hearing loss? What are some of the unique challenges with fitting a severe hearing loss? 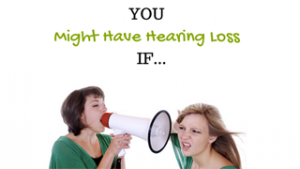 A severe hearing loss describes the severity, or level, of your hearing loss. With a severe hearing loss the person has difficulty hearing most environmental sounds and normal conversational speech levels. 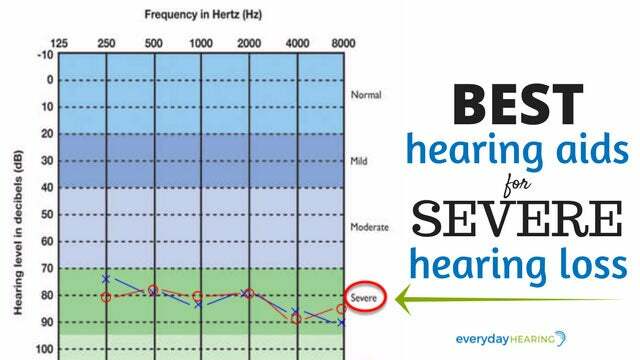 We classify a severe hearing loss as having hearing thresholds in the 71 to 90 decibel range. In most cases, hearing aids are the recommended treatment method for a severe hearing loss, although in some cases a cochlear implant may be recommended. Additional assistive listening devices such as FM systems may also be recommended in conjunction with a severe hearing loss if hearing aids are not enough to overcome their hearing difficulties, particularly in background noise. What makes a good hearing aid for severe hearing loss for adults? The number one thing a hearing aid well suited for severe hearing loss must do: provide sufficient gain at all speech frequencies without distortion, and without feedback occurring (that annoying whistling sound). People with severe hearing loss need a hearing aid that will provide them with good audibility, but also a clear sound quality and aggressive noise reduction features to assist in noisy environments without making them feel like the sound is “closing down” around them. They will also want to take into consideration what kinds of additional assistive listening devices are compatible with their hearing aid, such as a telecoil, phone compatibility, remote mic, or FM System, for additional assistance in challenging environments such as hearing on the phone, in restaurants, church, classroom or lecture-type setting, or in the car. 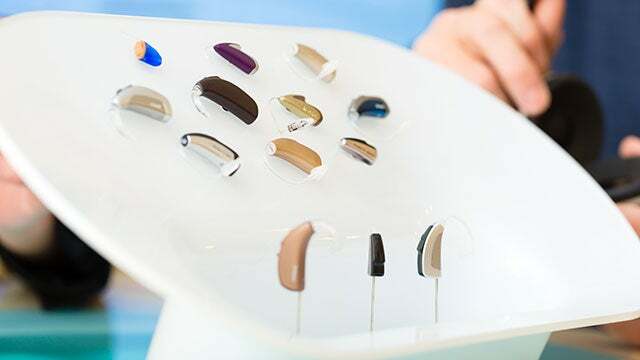 Finally, because people with severe hearing loss will be relying on their hearing aids every day all day, comfort and reliability should be taken into consideration as measured by the design and IP rating. One of the biggest challenges with fitting a severe hearing loss is providing adequate amplification for audibility without feedback. A behind-the-ear (BTE) or receiver-in-the-canal (RIC) hearing aid with a custom earmold is the best style hearing aid for a severe hearing loss. Here is a list of all our top picks for the best hearing aids for severe hearing loss. Note: If you are a current user of one of the hearing aids mentioned below, you can cast your vote by clicking on the star rating at the bottom of each table. Product Description: The dedicated power hearing aid portfolio designed specifically for listeners with severe to profound hearing loss. 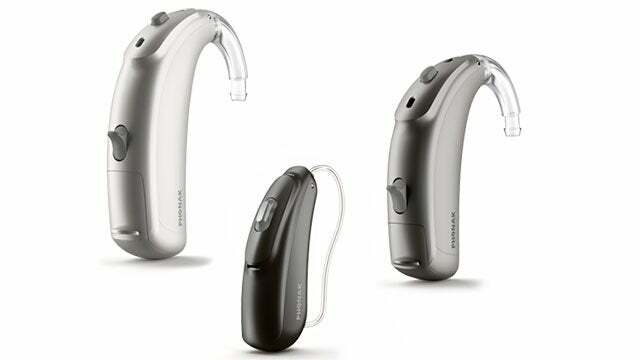 Product Description: The first hearing aid fast enough to support the brain. 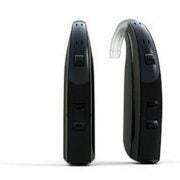 Product Description: ReSound ENZO2 brings the next generation of Smart Hearing aids to people with severe and profound hearing loss. 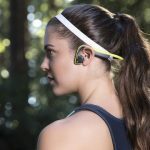 Product Description: UNIQUE is like no other hearing aid - packed with features, including 4 A/D converters with incredibly wide input, a sound classifier for intelligent listening and the Wind Noise Attenuation system that provides dramatically reduced wind noise. Product Description: Meet Max – the only Super Power hearing instrument that fights over-amplification to protect hearing health, while also maximizing speech intelligibility. For a better understanding of hearing aid IP ratings click here. For a better understanding of hearing aid telecoils click here. When a cochlear implant is not indicated, digital wireless hearing aids are the best option for treating severe hearing loss. When it comes to the options listed above, the prices can range anywhere from $500 up to $3500 for one hearing aid, depending on the performance level you choose and what types of professional services are included in the cost. However, we understand that in some cases, the need for a less expensive option is necessary. Read about our expertise and motivations here. When it comes to hearing aids…you get what you pay for. In other words, there are several different performance levels available in each of the models listed in the chart above. The quality of sound, particularly in background noise, is going to be better in a higher performance level product, which also means a higher price tag. It is important to balance your budget and your hearing needs to find the best solution for you. A custom earmold is usually necessary when it comes to fitting a severe hearing loss with either a BTE or RIC hearing aid. This will help to maximize audibility of speech without feedback occurring. Be sure to talk to your hearing healthcare professional about having a custom earmold made for your ear to obtain the best fit possible. Your success with a hearing aid is highly dependent on your speech discrimination abilities. Even with the best hearing aid, poor speech discrimination cannot be overcome with hearing aids alone. You may need to consider adding additional accessories, such as an FM system or remote mic option, to help in environments with a lot of background noise. Talk to your hearing healthcare professional about your speech discrimination abilities and what you can expect with your hearing aids. To find trusted hearing centres in your area, you can use our free online tool. If you have questions, please leave a comment below. Starkey offers a RIC device for severe hearing loss. It costs less than my current Phonak Audeo Smart aids but with my hearing loss changing from moderate to severe I need to upgrade. What if anything is known about Starkey? A local place pushes this brand. 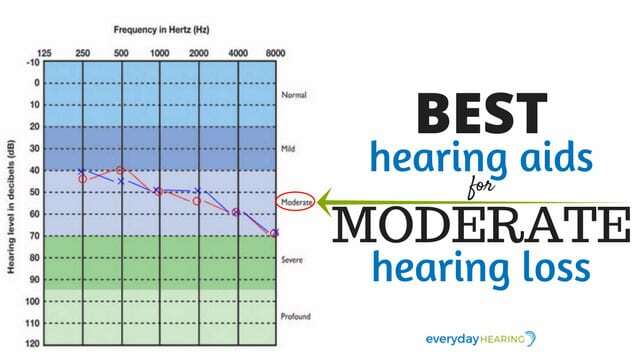 Starkey is one of the top hearing aid brands so I would recommend giving it a try for your severe hearing loss. Your local clinic should offer a trial with the hearing aids to make sure they work well for you. As an experienced hearing aid user you will be able to tell pretty quickly whether it is going to be a good model for you. Here are my comments posted on Starkey’s site: Is Starkey drunk? How could they charge a premium price for hearing aids that consistently fail to remain paired, or can’t be found by their janky app, and oftentimes, when I get a phone call in a noisy environment, these Stupid Starkeys think I want to have the outside noise amplified to painful levels and then I can’t hear my call in my aids. Only a drunk could make something this useless and then do little of nothing about it. They just don’t care. which brand is the best for severe high pitch hearing liss? I tried one pair in 2012 with not satisfied result too much noicy coing into ears still cannot heat clearly such as t s p. Any techolgy improved in recent years? Thanks. I have severely profound hearing loss range 80-95DB. Before I spend $5,900 on 2 BTE Trust 9 brand hearing aids through Beltone I want to be sure I’m not getting ripped off. The aids I’m about to purchase offer bluetooth features and have a nanotec protective coating along with automatic volume adjusting. I will also be able to adjust sound through my phone if needed. Lifetime customer service, 3 yr warranty and 3 yr supply of batteries because I guess I’m unable to get the rechargeable hearing aids. I noticed your aides when doing research and would love to get more information. 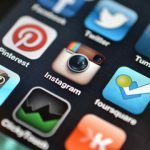 Are your brands water resisitant and adaptable to Android cell phones? I am interested in the 360° and water proof features … I’m extremely uncomfortable in group conversations and I like to exercise with my hearing aids so those features sound like it would help me and make me a happier person. So we can talk a bit more about this. We don’t have much experience with Beltone products so we are unable to comment on whether this particular device is the best for you. Any of the devices on this list will fit your needs. Beltone is the retail arm of GN Resound. Essentially the hearing aids Beltone sells are using the same\similar technology as GN Resound. 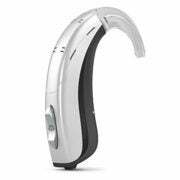 I currently use GN Resound Enzo2 hearing aids and so far are the best hearing aids I have used thus far. I recommend finding an audiologist that isn’t loyal to only 1 or 2 brands to get a better idea of what your options are. This website provides more information about Beltone. I like your point that you get what you pay for when looking for hearing aids. My father is losing his hearing and it’s time that we look into hearing aids. I’m trying to save money so that he can afford some good ones. That’s a great idea. Not everyone needs the best of the best BUT the better technology is going to mean better hearing and are worth the extra money! I am looking for high powered hearing aid for my brother…He was treated for MDR TB and he lost his hearing and it is severe. 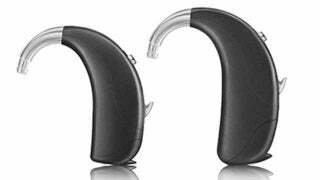 We do not publish prices because we do not sell these hearing aids. Hearing aids are required to be fit by a local hearing healthcare provider. You cannot legally get them online. I can’t fathom why you didn’t include Signia/Siemens in your selection of the top 5. They produce several outstanding models for profound hearing loss. I have almost severe hearing lost in my left ear which was caused by two times ear drum operations in 1986. Doctor provided a fake ear drum for my left ear. Therefore I lost a good amount of hearing and I end up having “Tinnitus” (ringing) in my left ear since my operation of 1986. I need to get an hearing aide for my left ear which possibly could also help to reduce my tinnitus noise. I never purchased a hearing aide since I tried to use my right ear for telephone and TV and basically for all hearing purposes for last 30 years. But, it is getting harder to hear specially when someone is on left side, in the theaters and I also have to turn my TV so high in order to understand the words. Is there any company that makes a type that could assist and work with tinnitus also? The “Ear -Miracle” local branch office in San Francisco area told me their top of the line type (about $5,800.0 for my left ear, one chargeable type and no battery) will help my tinnitus and be a good solution for my left ear. I am not sure if I did believe him and could trust any local sales person which is probably paid based on commission. Could you please provide some information and also suggest which brand and type would work for my left ear case. My right ear hearing is okay for a 65 year old man. FYI, my 2014 doctor chart shows about 40 db from 250 to about 2000 and then drops to 90 to 110 db between 4000 to 8000. I would greatly appreciate your response. Have been using Phonak for 3 years. I have problem with high frequency. Have not found Phonak to be much help in hearing conversation or music. Have revisted audiologist and I think they did their best. Programming of naidav-up for profound loss by NAL-R if possible.I am on trial for naida , however the male sound is garbled and poor discrimination . 60 mg daily – no change. Next thing, per ear doctor, is hyperbaric oxygen chamber (Medicare does not cover – BCBS Fed Employee debating over next 5 to 14 days whether they will. Too expensive for me out of pocket when maybe not work. tv program about 6 or 8 ft. away Thank you in advance for your input. Have to make a decision soon. Hi Jack. What you are describing is a decline in your speech discrimination abilities. When you have a sudden loss, poor speech discrimination can be a result. Unfortunately hearing aids will not correct your speech discrimination abilities, they will make sounds easier to hear, but not necessarily clearer. I would follow your doctors recommendations. Hope that helps. I’ve had the same Widex hearing aids for 15 years, though they only promised 7 when I bought them. Repaired twice during that time. My first pair were Starkey ( lasted 7 years) “in the canal “hearing aids which worked well but did not have sound suppression. I had to take them out when I went into a restaurant. Once I got the Widex, still in the ear but not in the canal, I had directional hearing, sound suppression of background noise, and a wonderful , life-changing, experience. I’m sure there is newer technology, but I find it hard to see how they could be better. I’d have a hard time living without them. That is a long time to have a pair of hearing aids, you must take very good care of them! The benefit of a new pair for you would be better/more natural sound quality in noisy environments as well as wireless/bluetooth functionality. and I now don’t hear well with them. My problem is that I can hear most of the time high tones and not low tones very well. hearing aids from that company and what would be the cost for two? The top of the line Phonak aids for a severe loss would be the Naida B90. I’m using a pair of Widex U-FS 440 HAs. Purchases 18 months ago. Using HS for the last 10 years. 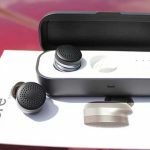 I have been recommended the Circa AI for severe hearing loss. Viewing this web page, I’m wondering, since this page states that the HAs review was updated last March, that since then you have any information on the aforementioned brand. Furthermore, do you know if within the Widex line-up, my current model can be updated? Typically for a severe hearing loss we recommend a RIC or BTE style hearing aid. The Circa Ai is a new NuEar RIC or BTE hearing aid. They are made by Starkey. 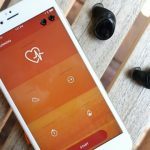 The focus of this hearing aid is on connectivity functions to bluetooth devices, so if that is a priority for you then it may be a good option. However, if you are looking at the best sound quality for severe loss with connectivity as well, I would consider the new Phonak Marvel RIC device. When it comes to a Widex hearing aid, the BEYOND are EVOKE are their new models, but neither come in HS styles at this time. I have two Phonak hearing aids for my ears. I only get little hearing from them. I have severe hearing the the cochlear operation was suggested to me. Is there a better hearing aid that would help get better sound versa the surgery. It depends on the age and power level of your current hearing aids, as well as the severity of your speech discrimination ability. You can go through a trial with different hearing aids before considering the cochlear implant. I have severe hearing loss in both ears, currently wear ReSound Cala 8 from Costco, and the aids are no longer sufficient. An audiologist recently told me these aids are not powerful enough for my needs and recommended Oticon. Is it true that these aids are insufficient for severe hearing loss? Can I increase their effectiveness by getting a custom mold installed (I doubt this will be possible because they have an in-the-ear receiver)? Also, what is your opinion on buying hearing aids from Costco? It may be true that your ReSound aids are not powerful enough for your severe hearing loss depending on the speaker strength. You could find out whether Costco is able to increase the speaker strength on them, as well as a custom mold. However, if your hearing aids are over 5 years old it will be much more beneficial if you consider new ones. We recommend getting hearing aids from a local Audiologists versus purchasing them from a big box store like Costco. The personalized service provided and specialized fitting at your Audiologist’s office can make all the difference for how well you hear with your hearing aids.